The dust has settled, and Grand Prix Las Vegas is now a week past. The implications of this Magic mini-con will be far-reaching. Wizards will need to re-evaluate the potential size of GPs, prize payouts, as well as quite a bit of tournament logistics. Also prize payouts. (I know I mentioned it already, but come on. I’m not even sure even a single X-3 got a payout at Vegas. Put yourself in in that position and ask if you’d ever want to attend a GP again.) Meanwhile, there’s currently some very honest and valuable discussion around the state of Magic organized play coverage. If Wizards acts appropriately, I would expect the next year to bring about a slew of changes to both large event OP, as well as the media surrounding it. In the meantime, we should give further consideration to the implications of Modern Masters. Last week I discussed the likelihood of MM increasing the price of many format staples despite being reprinted. With MM driving many new players into the format, the demand on the existing supply will increase noticeably, and the influx of cards will not be enough to stem the tide. What about the cards that weren’t in Modern Masters though? 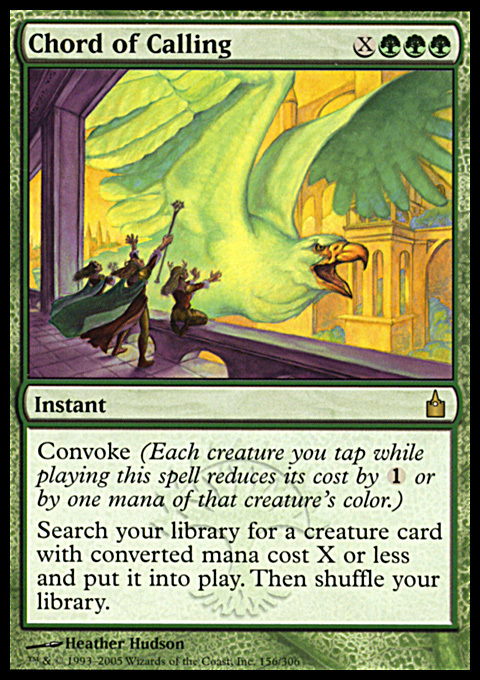 The mere fact that a card wasn’t in MM could be enough to drive a price increase, resulting in their being even more susceptible to popping than the cards reprinted. Granted, Wizards hit a lot of the staples – they couldn’t just print every single format-playable card – so there’s plenty of room to look for opportunity. If our goal is to get in ahead of market shifts, we need to evaluate the current price point of cards alongside their utility, price points of similar cards, and availability. Chord of Calling. (c) 2005 Wizards of the Coast. The banner card for this effect is Chord of Calling. It used to be only a few dollars, and then early on in Modern’s lifespan it jumped up to $10-12. A while ago several financial types on Twitter pegged it as likely to rise, and by the Monday after GP Vegas, the card had nearly doubled to upwards of $20. I would guess the ceiling on this is maybe $25 or even $30 if it sees a brief resurgence in Modern. However, it’s not played in any other format aside from EDH, and while it’s good in Modern, it’s only good in certain types of decks. Still, this card’s new price tag is probably not dipping much below $20. I’m not advocating you buy in on this card in particular; rather, it illustrates what can happen when seemingly underpriced cards are suddenly noticed by the market or vendors. One group of prime targets for this is the Scars of Mirrodin Fastlands. Shortly after their rotation, all were in the $1.50 to $4.00 range. They’ve snuck up a bit since then, and I expect they’ve got plenty of room to grow. There 3 most commonly played land cycles in the format are the Zendikar Fetchlands, the Shocklands, and the Fastlands. The Fetches are all $25-$40 (more on that in an upcoming article), and the Shocks used to all be $20+ until seeing a massive reprint in RTR. Even still the shocks are all $7-$10, and by the start of the next Modern PTQ season they will see pressure to rise on two fronts – both from being the out-of-print land in standard, as well as PTQ-goers needing to finish their playsets. Those two factors will likely push them all into the $15-$20+ range. This leaves the Fastlands as the third most played cycle in the format at a lowly $3-$5. I doubt we’ll see them as high as $20, but they could easily crest $10. 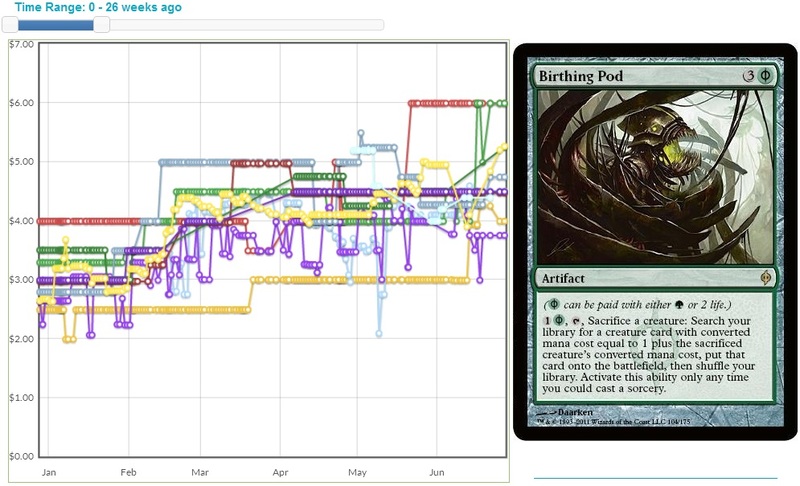 Recall that Jund typically played about the same number of Fastlands as shocks, as did the Birthing Pod decks. Any aggressive deck will fill up with on-color Fastlands as well. Speaking of Birthing Pod, this is another card that seems poised to at least double. Ask anyone familiar with the Modern format what the best deck currently is, and there’s a real good possibility the answer is going to include this card. Whether the flavor of the week is Kiki-Jiki or Melira, they’re still both using four Birthing Pod. This is one of those cards that only gets better as more creatures are printed (which is how Chord of Calling works as well, by the way). Birthing Pod decks provide a great deal of strategic value, and can be tuned to just about any metagame should the pilot desire. It’s been slowly creeping up since its rotation, and $10-$15 doesn’t seem unreasonable down the road. There are a plethora of cards that fall into the same category as Chord of Calling, the Fastlands and Birthing Pod. Keep an eye out for them as you browse Modern deck lists, trade binders, and Gatherer. Anytime you think to yourself “hmm that card seems cheaper than I thought it would be,” consider that a flag to closely examine the card’s potential. Join me next week when we consider safe investments in a post-reserved list format. I’m starting to wonder if Chord of Calling or Birthing Pod will actually be banned. Wizards does not have a consistent set of guidelines that they follow to help people predict bans. Many of the banned cards for Modern should honestly be unbanned. Green Sun’s Zenith may have been an enabler to abuse Dryad Arbor on turn 1, but the card itself is not really broken. Who ever oppressively lost to a first turn Dryad Arbor? It’s only green creatures too. Yet, we have two cards that do the same thing repeatedly, allowing pod decks to run much more consistently compared to other decks. Isn’t consistency one of the abstract principles that Wizards has been using to justify banning cards, especially when those cards enable combos? I’m not sure though, as there is a lot of politics involved with bannings. They ban Wild Nacatl because it’s too efficient and forces every aggro deck to run them, but then they don’t ban Tarmogoyf, who’s also too efficient and every deck runs him. The loss of Wild Nacatl hasn’t helped diversity with aggro decks like it was suggested either, as green/red is still the dominant aggro deck (and it’s still not a tier 1 deck in modern, but it might have been if it had Wild Nacatl). And apparently a 3/3 do nothing creature is more oppressively than Dark Confidant as well? Mental Misstep is not okay according to Wizards because it will counter Lightning Bolt, Path to Exile, Thoughtseize and all of the 1-drop creatures. Yet the format does have access to Cavern of Souls, which means the format had outs to it. And while Mental Misstep is banned, Thoughtseize is allowed to run over every deck and has become a pillar to the format. Every deck that can support black runs this card, as there is no reason not to. It is far more back-breaking than Mental Misstep, but banning it would piss off a lot of collectors. That seems to be the case for a lot of the bans. Banning Wild Nacatl would not piss off collectors, but banning Dark Confidant or Tarmogoyf would. Birthing Pod is in the middle somewhere. It’s not an ultra expensive card, but Pod decks are unique to modern. They didn’t do very well in Standard, and it’s not a good deck in Legacy, so by banning pod, it’s going to make a lot of people upset and remove a unique deck that only Modern has. At the same time, Wizards didn’t like that Jund was being played by 20%+ of the field and was dominating tournaments, and that is exactly what Pod has been doing now, especially since they added Voice of Resurgence to the deck list. So to make a long story short, I am hesitant to buy into anything about pod. We’ve already missed out on Chord of Calling if you didn’t already pick those up, and with the deck performing so well in Modern, Wizards could intervene at any time. And since Wizards does not like combo decks – the only decks that could actually beat Bod with reasonable consistency – Pod will probably remain on top for the foreseeable future. God I love modern! Thank you Wizards!